When marketers discuss Facebook Insights measurements, there are two words that cross their lips most often: Reach and Engagement. Meanwhile, there are two terms that go completely ignored. They’re nowhere to be found within the web version of Facebook Insights. They’re only found within Insights exports. The reason few marketers discuss these metrics could be partially due to the fact that so few understand what they mean. And Facebook can be blamed for this, not only because the definition isn’t incredibly clear but because there is another term that is defined in nearly exact terms which causes significant confusion. What are Consumers and Consumptions? If you dig into the individual tabs for Consumers and Consumptions within the exports, you’ll find columns for Link Clicks, Other Clicks, Photo Views and Video Plays. Stories generated without clicks on page content (e.g., liking the page in Timeline) are not included. I’m going to look at this a bit more closely in a minute, but the main thing to understand here is that Consumptions measure any click on Page content, whether it generates a Story or not. The clicks above are those that Facebook measures and tracks in Insights. But based on the definition of “clicked anywhere,” we’re not covering everything here. As you can see, I’m not completely clear here. But Facebook does say that it includes “clicks anywhere.” So if we are to take that definition literally, it should include every item listed above, including when our post is hidden or reported as spam. Even though there’s some ambiguity here, it’s quite clear that these measurements are extremely important and need to be monitored by marketers. I believe strongly that they are far more important than the almighty “Reach” metric, which gets far more attention (more on that later). The number of unique users who clicked anywhere in your posts. The number of unique users who engaged with your Page. Engagement includes any click or story created. Consumers are people who “click anywhere” within your posts or Page content. Engaged Users are people who “clicked anywhere in your posts.” So what the heck is the difference? I reached out to several knowledgeable people in Facebook marketing who work closely with these stats, and I couldn’t get a clear and definitive answer from anyone. In fact, it seems that the answer has changed over time. Based on an article by Josh Constine for InsideFacebook back in 2011, it appears that Consumptions once meant “The number of people who clicked on any of your content without generating a story.” That is definitely no longer the case. This stumped me at first, but it now makes sense. Engagement includes all clicks and all stories generated about your Page. Consumption includes all clicks, whether they result in a story or not. This is the distinction: Engagement includes stories generated that were not the result of a click within your content. Consumption does not. As a result, Engagement is always equal or higher. The example Facebook gives of “liking the page in Timeline” doesn’t clarify things for me. Whose Timeline? The Page or a user? It raises more questions than it provides answers. And I know there are items missing from my list here since none of them are on the post level. I can’t think of a single example of a story generated from engagement with a Page post that is not the result of a click. Can you?? 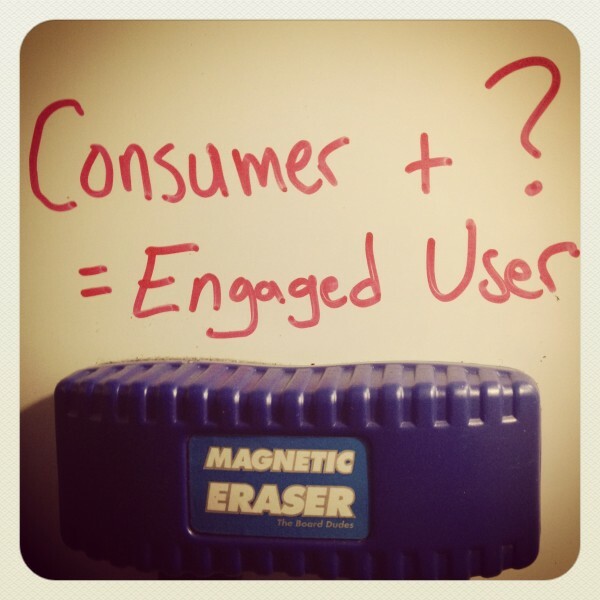 While it certainly would be helpful to know this, we at least now understand the difference between an Engaged User and a Consumer. They are identical in that both include any click within your Page or post, whether they do or do not result in a story. The only difference is that Engaged User also includes stories that weren’t the result of a click. So the real question is this: Why in the world are both stats necessary? Your guess is as good as mine. But Facebook actually provides more details for Consumers and Consumptions within the exports (providing columns for Consumption types) than Engaged Users (no such detail). So it’s my belief that we need to start using the terms “Consumer” and “Consumption” to be more accurate and consistent across the board. The jury is out on the value of the Reach metric. Some think it’s valuable. Some even use it as a determining factor when running ads. I think these people are crazy. Reach is a fuzzy and inexact metric that measures the number of people who may have seen your content. But isn’t the Consumers metric what we actually want here? We know that those who clicked anywhere within our post saw it. There is no disputing that. There is no fuzziness. What’s nice is that this metric doesn’t only include the Storytellers (those who created a story by commenting, liking or sharing). It includes the Lurkers as well, assuming they clicked anywhere within the post. How many people saw my post? At least X [the number of people who consumed it]. The number of total people who saw it will be higher. But this is the starting point to determine the number of people who had any interest whatsoever in my content. Consumers / Total Fans: What percentage of your Fans consumed your post? Talking About This / Consumers: What percentage of Consumers created a story? Stories / Consumptions: What percentage of Consumptions resulted in a story? 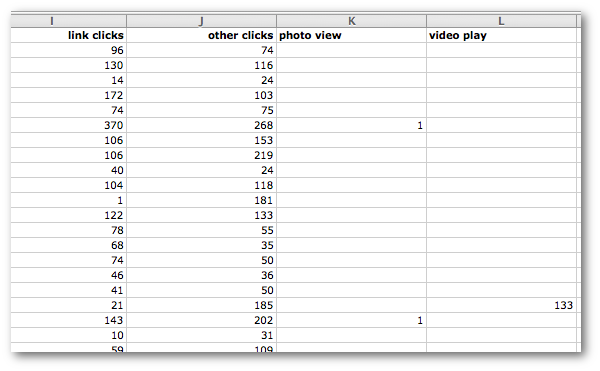 Link Clicks / Consumptions: What percentage of Consumers clicked your link? Shares / Consumptions: What percentage of Consumers shared your content? This is real data here, people. This is actionable data that means something. On March 22, I will be holding a free webinar to cover these and other advanced topics associated with Facebook Insights. Go here to register!